Posted by Dave Emory ⋅ May 11, 2016Post a comment Email This Post Print This Post Tweet This! Introduction: As the title indicates, this program brings up do date topics of discussion from previous programs and/or introduces new threads of inquiry. In FTR #791, we highlighted research indicating that Hitler did not die in the Bunker as believed. The authors of Grey Wolf: The Escape of Adolf Hitler posit that Allen Dulles and Martin Bormann reached a deal to exchange Hitler for German military expertise rendered under Project Paperclip and the sparing of the treasures of Western art. In FTR #864, we detailed Peter Levenda’s research indicating that Hitler may have ultimately found his way to Indonesia. As noted by Williams, Dunstan and Levenda, many documents about Hitler’s postwar whereabouts are still classified, more than 70 years after his alleged death. WHY? After updating the inquiry about Hitler’s fate, the program sets forth some of the most recent repressive measures undertaken by Narendra Modi’s Hindu Nationalist/fascist government in India. Modi’s trip to the Silicon Valley was the focal point of grotesque pandering on the part of sycophantic Silicon Valley executives, who looked to the RSS/BJP shill to open up the large Indian market to their products. The tech executives have remained mum on Modi’s active moves to counter online coverage of his government that is less than favorable. Student protesters have been brutalized by New Delhi police, acting in concert with unnamed, out-of-uniform operatives, another phenomenon that has failed to draw the attention of Silicon Valley critics. After reviewing Ayatollah Khomeini’s political evolution from a Muslim-Brotherhood-affiliated Shiite group, we noted the late Antonin Scalia’s networking with a group headed by a Habsburg–the Archduke of Austria. The conclusion of the program revisits the increasingly surreal world of high-tech, cyber-terrorism and technocratic fascism. After highlighting the mysterious case of a Boston subway train that “went rogue,” we detail the hacking of a water treatment plant and consequent tampering with the chemicals used in the water. Reviewing information from FTR #901, we note that the skilled Nazi hacktivist and Glenn Greenwald associate Andrew Auernheimer (aka “Weev”) is developing methodologies suited to the new “Internet of things” and has caused printers to issue racist screeds. More than a little scary is the story of Microsoft’s new Tay AI chatbot. Designed to interact with Twitter users, it soon morphed into a Nazi. Worth contemplating in this regard is the fact that the develoment of AI is seen as the primary focal point of high-tech commercial R & D.
The conclusion of the program details the enormous projected losses of labor to robotics and AI. An 83% chance that jobs paying less than $20.00 an hour will be replaced by technology. The massive loss of construction jobs to technology–this in a business that does much to drive the U.S. and global economies. The failure of Donald Trump and “Boinie” to address the technological replacement of jobs. 1a. In FTR #791, we highlighted research indicating that Hitler did not die in the Bunker as believed. The authors of Grey Wolf: The Escape of Adolf Hitler posit that Allen Dulles and Martin Bormann reached a deal to exchange Hitler for German military expertise rendered under Project Paperclip and the sparing of the treasures of Western art. In FTR #864, we detailed Peter Levenda’s research indicating that Hitler may have ultimately found his way to Indonesia.As noted by Williams, Dunstan and Levenda, many documents about Hitler’s postwar whereabouts are still classified, more than 70 years after his alleged death. WHY? 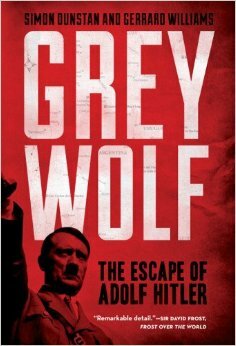 Grey Wolf: The Escape of Adolf Hitler by Simon Dunstan and Gerrard Williams; Sterling [HC]; Copyright 2011 by Simon Dunstan, Gerrard Williams and Spitfire Recovery Ltd.; ISBN 978-1-4027-8139-1; p. 242.
. . . . During this period [the late 1940’s], the FBI was taking reports of Hitler being in Latin America very seriously. Thousands of documents pertaining to Hitler from these years are still classified as Top Secret on both sides of the Atlantic; nevertheless, and despite the very heavy censorship of the few files released into the public domain, some information can be gleaned. . . .
“Death Threats for Hitler Book Author Gerard Williams;” Wales Online; 3/21/2013. A South Wales author who has sensationally claimed Adolf Hitler escaped the bunker to live in Argentina says he and his research team have received death threats. Former Bridgend Grammar School pupil Gerrard Williams, pictured, spent five years with military historian Simon Dunstan researching Grey Wolf – The Escape of Adolf Hitler. It claims Hitler spent 17 years in the foothills of the Andes in Argentina until his death in 1962. The book also claims Hitler’s escape was carried out with the blessing of the US authorities who wanted rocket secrets and details of where priceless art treasures were hidden. Yesterday, Swansea-born Williams, who grew up in Coychurch, Bridgend, said: “We have ruffled some very big feathers. Williams, who studied journalism in Cardiff and worked for the BBC and Sky News, said: “I discovered the story while working on a documentary about the Falklands War in Argentina. ”History books say with Berlin’s Reich Chancellery virtually surrounded on April 30, 1945, Hitler shot himself, while his new wife Eva Braun bit into a cyanide capsule to evade capture. Their petrol-soaked bodies were then burned. But Williams claims Hitler and Braun slipped out of the besieged Führerbunker via a secret tunnel and were replaced by doubles chosen by Reichsfuhrer Martin Bormann.He says they were then whisked by plane to Spain and by submarine to the Argentine coast at Necochea. Williams spent five years with military historian Simon Dunstan researching Grey Wolf – The Escape of Adolf Hitler. It claims Hitler spent 17 years in the foothills of the Andes in Argentina until his death in 1962. 2a. Narendra Modi’s gov­ern­ment is set­ting up a new insti­tu­tion that will be tasked with round-the-clock mon­i­tor­ing of blogs, web por­tals of TV chan­nels and news­pa­pers, and social media plat­forms such as Face­book, Twit­ter, Insta­gram and YouTube, among oth­ers. All com­ments and threads will be ana­lyzed. The history and psy­cho­log­i­cal pro­fileof each poster will be assessed for pos­si­ble sub­ver­sive­ness and rad­i­cal­ism. When deemed nec­es­sary, counter-messages will be inserted into the threads to quell a pos­si­ble snow­balling of neg­a­tive pub­lic opinion. How exactly this ini­tia­tive is sup­posed to quell the neg­a­tive opin­ions gen­er­ated by overt in-your-face Big Brother-tactics is unclear. One wonders how effec­tive an agency ded­i­cated to ‘plug­ging resent­ment trig­gered by news items’ is going to be at reduc­ing resent­ment when the very exis­tence of the agency is bound to gen­er­ate even more resent­ment and all pro-government com­ments are just going to be assumed to be government-paid trolls. “Now, Govt Cyber Cell to Counter ‘Neg­a­tive’ News” by Ami­tav Ran­jan; The Indian Express; 2/23/2016. Every time a neg­a­tive nar­ra­tive sur­faces, a pos­si­ble counter would be ini­ti­ated — through press releases, brief­ings or press con­fer­ences, depend­ing on the inten­sity or stand­ing of the post,” said sources. The Government plans to set up a spe­cial media cell to track con­tent online, and counter news and com­ments that it decides are neg­a­tive or provocative. Last month, the National Secu­rity Coun­cil Sec­re­tariat (NSCS) pro­posed that a National Media Ana­lyt­ics Cen­tre (NMAC) be cre­ated to keep mon­i­tor and analyse round-the-clock blogs, web por­tals of TV chan­nels and news­pa­pers, and social media plat­forms such as Face­book, Twit­ter, Insta­gram and YouTube, among others. “The gov­ern­ment will keep a watch on the nar­ra­tive in all such threads. Every time a neg­a­tive nar­ra­tive sur­faces, a pos­si­ble counter would be ini­ti­ated — through press releases, brief­ings or press con­fer­ences, depend­ing on the inten­sity or stand­ing of the post,” said sources. Last August, the gov­ern­ment had directed all min­istries to set up quick response teams — com­pris­ing senior min­istry offi­cials, nodal offi­cers from the Press Infor­ma­tion Bureau and inde­pen­dent experts — to defend its case in the face of neg­a­tive news. Sources said that the NMAC pro­posal is based on track­ing soft­ware designed by Pon­nu­rangam Kumaraguru, an Assis­tant Pro­fes­sor at Delhi-based Indraprastha Insti­tute of Infor­ma­tion Technology. The soft­ware will gen­er­ate rel­e­vant tags to high­light “bel­liger­ent” com­ments or social media chats, they added. At a deeper level, the soft­ware would comb posts and com­ments to clas­sify them into neg­a­tive, neu­tral and pos­i­tive cat­e­gories while high­light­ing rel­e­vant text, sources said. It will also show up if the neg­a­tive post­ing was fac­tu­ally cor­rect or “an inten­tional canard”, they said. “The soft­ware would also help recall the past pat­tern of the writer to check the num­ber of times he took a neg­a­tive or pos­i­tive stand, his back­ground, and pref­er­ences of web­sites and areas of inter­est to judge whether they were aimed at foment­ing trou­ble or rad­i­cal­i­sa­tion,” said sources. They said the objec­tive is to come up with “instant coun­ters” on social media to plug resent­ment trig­gered by news items so that per­sonal opin­ions do not snow­ball into pub­lic protests and threaten law and order. The feed­back on covert or overt posts would be passed on to secu­rity agen­cies or higher author­i­ties for pos­si­ble inter­ven­tion, they said. The NMAC pro­posal sug­gests an inter-ministerial com­mit­tee of offi­cials from NSCS and the Home, I&B and Exter­nal Affairs min­istries for analy­sis, coor­di­na­tion, infor­ma­tion dis­sem­i­na­tion and feed­back on pub­lic per­cep­tion and national security. The NMAC would be the third obser­va­tion post for the NDA gov­ern­ment after the New Media Wing, the online eyes and ears pro­vid­ing daily reports on the world of social media, and the Elec­tronic Media Mon­i­tor­ing Cen­tre (EMMC) that mon­i­tor 600-plus chan­nels round the clock. As reported by The Indian Express on August 29, the 200 con­tent audi­tors at EMMC sends hourly reports and text mes­sages of news break­ing on any chan­nel to top bureau­crats includ­ing the Prin­ci­pal Sec­re­tary to the Prime Min­is­ter, the National Secu­rity Advi­sor and the Cab­i­net Secretary. The New Media Wing trawls web­sites, includ­ing micro blogs, as well as traf­fic relat­ing to news breaks on the social media sites to pick up gov­ern­ment rel­e­vant trends. It then under­takes a “sen­ti­ment analy­sis” to gauge pub­lic opinion. The pro­posal for NMAC was sent to PIB director-general Frank Noronha by Deputy National Secu­rity Advi­sor Arvind Gupta for set­ting it up at the National Media Cen­tre, said sources. How­ever, they added, a four-member com­mit­tee formed to exam­ine the pro­posal has opposed locat­ing it at NMAC due to “lack of space”. “Instead of Listening, Modi Govt Brutally Beating Students for Protesting Against RSS: Rahul Gandhi” [Zee Media Bureau]; Zee News; 2/1/2016. Even as Delhi Police on Monday faced widespread criticism over a video clip that shows the alleged assault on the students by male constables and some men who are not in uniform, Congress vice president Rahul Gandhi said that instead of listening to students, Modi government was brutally beating them up. “Shocking attack on students. Instead of listening to them, now the Modi government is brutally beating them up for protesting against the RSS,” Rahul said. . . .
. . . . In the short video clip, a constable is seen dragging a female protester by her hair and pushing her down. A youth is also seen being bashed. Two journalists, who have alleged that they were beaten up and their cameras smashed while covering the protest, claimed that the police action was “unprovoked”, as per PTI. The clip has gone viral on various social media sites. Meanwhile, Chief Minister Arvind Kejriwal today hit out at Delhi Police alleging that it was being used as RSS and BJP’s “private army” under a political dispensation that is at “war” with students across the country. “Delhi police being used by BJP/RSS as their private army to terrorise and teach lesson to anyone opposing BJP/RSS. I strongly condemn attack on students,” he tweeted. “FTII, Rohith case, Hyderabad University, IITs and now brutal attack on Delhi students. Modi government seems to be at war with students all across,” he wrote in another tweet. . . .
“Cold War, Holy Warrior” by Robert Dreyfuss; Mother Jones; January/February/2006.
. . . The regime of the ayatollahs in Iran grew out of a secret society called the Devotees of Islam, a Brotherhood affiliate whose leader in the 1950s was the mentor of Ayatollah Runollah Khomeini. . . .
4. Antonin Scalia spent his last hours with mem­bers from an Austrian-based secret-society ded­i­cated to Saint Hubert, the Catholic saint of deer hunt­ing, dating back to the 17th century. The head of the group is a member of the Hapsburgs! “Jus­tice Scalia Spent His Last Hours with Mem­bers of this Secre­tive Soci­ety of Elite Hunters” by Amy Brit­tain and Sari Hor­witz; The Wash­ing­ton Post; 2/24/2016. When Supreme Court Jus­tice Antonin Scalia died 12 days ago at a West Texas ranch, he was among high-ranking mem­bers of an exclu­sive fra­ter­nity for hunters called the Inter­na­tional Order of St. Huber­tus, an Aus­trian soci­ety that dates back to the 1600s. After Scalia’s death Feb. 13, the names of the 35 other guests at the remote resort, along with details about Scalia’s con­nec­tion to the hunters, have remained largely unknown. A review of pub­lic records shows that some of the men who were with Scalia at the ranch are con­nected through the Inter­na­tional Order of St. Huber­tus, whose mem­bers gath­ered at least once before at the same ranch for a cel­e­bra­tory weekend. Mem­bers of the world­wide, male-only soci­ety wear dark-green robes embla­zoned with a large cross and the motto “Deum Dilig­ite Ani­malia Dili­gentes,” which means “Hon­or­ing God by hon­or­ing His crea­tures,” accord­ing to the group’s web­site. Some hold titles, such as Grand Mas­ter, Prior and Knight Grand Offi­cer. The Order’s name is in honor of Hubert, the patron saint of hunters and fishermen. Cibolo Creek Ranch owner John Poindex­ter and C. Allen Fos­ter, a promi­nent Wash­ing­ton lawyer who trav­eled to the ranch with Scalia by pri­vate plane, hold lead­er­ship posi­tions within the Order. It is unclear what, if any, offi­cial asso­ci­a­tion Scalia had with the group. An attor­ney for the Scalia fam­ily did not respond to requests for com­ment for this article. Two other pri­vate planes that landed at the ranch for the week­end are linked to two men who have held lead­er­ship posi­tions with the Texas chap­ter of the Order, accord­ing to a review of state busi­ness fil­ings and flight records from the airport. After Scalia’s death, Poindex­ter told reporters that he met Scalia at a “sports group” gath­er­ing in Wash­ing­ton. The U.S. chap­ter of the Inter­na­tional Order of St. Huber­tus lists a suite on M Street NW in the Dis­trict as its head­quar­ters, although the address is only a mail­box in a United Par­cel Ser­vice store. The Inter­na­tional Order of St. Huber­tus, accord­ing to its web­site, is a “true knightly order in the his­tor­i­cal tra­di­tion.” In 1695, Count Franz Anton von Sporck founded the soci­ety in Bohemia, which is in modern-day Czech Republic. The group’s Grand Mas­ter is “His Impe­r­ial High­ness Ist­van von Habsburg-Lothringen, Arch­duke of Aus­tria,” accord­ing to the Order’s web­site. The next gath­er­ing for “Ordens­broth­ers” and guests is an “investi­ture” March 10 in Charleston, S.C. The society’s U.S. chap­ter launched in 1966 at the famous Bohemian Club in San Fran­cisco, which is asso­ci­ated with the all-male Bohemian Grove — one of the most well-known secret soci­eties in the country. Poindex­ter told Cul­tureMap Hous­ton that some of the guests dressed in “tra­di­tional Euro­pean shoot­ing attire for the boxed bird shoot com­pe­ti­tion” and for the shoot­ing of pheas­ants and chukar, a type of partridge. For the hunt­ing week­end ear­lier this month, Poindex­ter told The Wash­ing­ton Post that Scalia trav­eled to Hous­ton with his friend and U.S. mar­shals, who pro­vide secu­rity for Supreme Court jus­tices. The Post obtained a Pre­sidio County Sheriff’s Office report that named Fos­ter as Scalia’s close friend on the trip. Sher­iff Danny Dominguez con­firmed that a pho­to­graph of Wash­ing­ton lawyer C. Allen Fos­ter is the same man he inter­viewed at the ranch the day of Scalia’s death. From Hous­ton, Scalia and Fos­ter char­tered a plane with­out the mar­shals to the Cibolo Creek Ranch airstrip. In a state­ment after Scalia died, the U.S. Mar­shals Ser­vice said that Scalia had declined a secu­rity detail while at the ranch. The friend, Louisiana-born Fos­ter, is a lawyer with the Wash­ing­ton firm White­ford, Tay­lor & Pre­ston. He is also known for his pas­sion for hunt­ing and is a for­mer spokesman for the hunt­ing group Safari Club. A sec­re­tary at Foster’s law firm said he is trav­el­ing in Argentina. The firm’s direc­tor of mar­ket­ing, Mindee L. Mosher, said Fos­ter was trav­el­ing and she would try to con­tact him. A woman answer­ing a phone asso­ci­ated with Fos­ter hung up when asked for comment. Planes owned by Wal­lace “Happy” Rogers III and the com­pany of A.J. Lewis III left from San Anto­nio and arrived at the ranch just after noon Feb. 12. The planes departed the ranch about 30 min­utes apart Feb. 14, accord­ing to flight records pro­vided to The Post by FlightAware. Rogers owns the Buck­horn Saloon and Museum in San Anto­nio. He has donated $65,000 to Repub­li­can can­di­dates since 2008. Lewis is the owner of a restau­rant sup­plier com­pany, also based in San Anto­nio. He has given $3,500 to GOP can­di­dates since 2007. Rogers and Lewis have both served as prior offi­cers in the Texas chap­ter of the Inter­na­tional Order of St. Huber­tus, accord­ing to Texas busi­ness records. Rogers spoke to a Post reporter briefly on the phone and con­firmed that he was at the ranch the week­end of Scalia’s death. He declined to com­ment further. Lewis did not respond to sev­eral attempts for comment. The Pre­sidio County Sheriff’s Office released an inci­dent report to The Post on Tues­day that revealed Foster’s name as Scalia’s trav­el­ing com­pan­ion and pro­vided details about the dis­cov­ery of his body. Law enforce­ment offi­cials told The Post that they had no knowl­edge of the Inter­na­tional Order of St. Huber­tus or its con­nec­tion to Poindex­ter and ranch guests. The offi­cials said the FBI had declined to inves­ti­gate Scalia’s death when they were told by the mar­shals that he died from nat­ural causes. 5. Exemplary of the frightening developments that herald a new era of civilization is the MTA train that “went rogue.” Remembering the old folk song about Charley on the MTA, things are going to a new level indeed. “A Boston Subway Train Just Went Rogue” by Steve Huff; Maxim; 12/10/2015. Hack? Ghost Conductor? Whatever it was, something really weird happened on the Red Line. Imagine you’re on a subway train, near the front, and perhaps you can see into the operator’s cab. It’s empty, but the train starts moving anyway. And it doesn’t stop. It’s a creepy scenario—and it happened early Thursday on Boston’s Red Line train, which left the Braintree Station just after 6 a.m. without an operator. According to a statement released by the Massachusetts Bay Transportation Authority (MBTA), the train ran without stopping until it was just north of the North Quincy Station, where MBTA staff managed to stop the train by switching off the electrified third rail. The same woman indicated there were more than 20 people on the train, and they were told that the conductor had been taken to the hospital. Boston’s ABC affiliate reported late Thursday morning that a source told one of their reporters that the operator had left the train at Braintree Station to check on an issue. The train struck the operator and continued on its way. Boston’s subway system has been plagued with problems, such as multiple major issues during the severe winter of 2014-2015, when there were third rail failures, overwhelmed snow plows and whole branches of the system at a standstill. Recently, two people were struck and killed by trains in separate incidents. Whatever’s going on with Boston’s rail transit system may not actually involve remote hacking or vengeful spirits, but it’s starting to look bad enough to prompt commuters to actually risk driving their own cars in Boston, which may be the most terrifying thing of all. “Hacktivists Mess with Chemicals in Water Treatment Plant;” Nextgov.com; 3/24/2016. Talk about your doomsday scenario. Hackers infiltrated a water utility’s control system and changed the levels of chemicals being used to treat tap water, according to Verizon Security Solutions. Verizon describes the attack against the “Kemuri Water Company,” a pseudonym for a real firm in an unspecified country, in this month’s IT security breach report. A “hacktivist” group with ties to Syria compromised Kemuri’s computers after exploiting unpatched web vulnerabilities in a payment portal that was connected to the public Internet. The hack – which involved SQL injection and phishing – was made easier because login credentials for the operational control system were stored on the Web server. The system regulated valves and ducts that controlled the flow of water and chemicals used to treat it. Verizon discovered four separate connections over a 60-day period. During these connections, the threat actors modified application settings with little apparent knowledge of how the flow control system worked. In at least two instances, they managed to manipulate the system to alter the amount of chemicals that went into the water supply and thus handicap water treatment and production capabilities so that the recovery time to replenish water supplies increased. Fortunately, based on alert functionality, KWC was able to quickly identify and reverse the chemical and flow changes, largely minimizing the impact on customers. No clear motive for the attack was found. The hacktivists had manipulated the valves controlling the flow of chemicals twice – though fortunately to no particular effect. It seems the activists lacked either the knowledge or the intent to do any harm. The same hack also resulted in the exposure of personal information of the utility’s 2.5 million customers. There’s no evidence that this has been used for fraud. Well, at least the Weev hasn’t got­ten around to hack­ing baby mon­i­tors and children’s toys to spew outwhite suprema­cist pro­pa­ganda to impres­sion­able young minds, although it sounds like it’s just a mat­ter of time given the ease of hack­ing such devices and the Weev’s insa­tion­able appetite for Nazi trolling. So if you’d like to avoid expos­ing your kids to an unin­vited “imag­i­nary friend” liv­ing in your toys and house­hold prod­ucts (a friend who doesn’t seem to approve of your kid’s non-white friends), you’ll prob­a­bly want to ensure your internet-connected devices aren’t one of the super eas­ily hack­able brands. There’s no short­age of rea­sons for secur­ing your internet-connected devices, but you can now add “pre­vent­ing the Weev from Nazi trolling my fam­ily” to the list. “A Hacker Made ‘Thou­sands’ of Internet-Connected Print­ers Spit Out Racist Flyers” by Lorenzo Franceschi-Bicchierai; Vice Motherboard; 3/27/2016. The noto­ri­ous hacker and troll Andrew Auern­heimer, also known as “Weev,” just proved that the Inter­net of Things can be abused to spread hate­ful pro­pa­ganda. On Thurs­day, Auern­heimer used two lines of code to scan the entire inter­net for inse­cure print­ers and made them auto­mat­i­cally spill out a racist and anti-semitic flyer. Hours later, sev­eral peo­ple started report­ing the inci­dent on social media, and even­tu­ally a few local news out­lets picked up on the story when col­leges and uni­ver­si­ties all over the United States found that their net­work print­ers were spilling out Auernheimer’s flyer. Auern­heimer detailed this “brief exper­i­ment,” as he called it, in a blog post on Fri­day. Later, in a chat, he said that he made over 20,000 print­ers put out the flyer, and defended his actions. The hacker explained that all he did was cre­ate a script that would scan the whole inter­net to find print­ers that had port 9100, a com­mon port used by net­work print­ers, open. Then, the script made them print the flyer. This inci­dent shows, once again, that the appar­ently bright future of the so-called Inter­net of Things has a dark side too: hack­ers can creep out babies tak­ing advan­tage of inse­cure baby mon­i­tors, expose kids’ iden­ti­ties thanks to internet-connected toys that col­lect and leave their data exposed online, or send a hate­ful white suprema­cist flyer all over the coun­try with two lines of code. Despite that, Auern­heimer, who was con­victed of hack­ing crimes in 2012, told me that he’s not worried. . . .
8. Taking a look at the future of fascism, Tay, a “bot” created by Microsoft to respond to users of Twitter was taken offline after users taught it to–in effect–become a Nazi bot. It is noteworthy that Tay can only respond on the basis of what she is taught. Inevitably, Underground Reich elements will craft a Nazi AI that will be able to do MUCH, MUCH more! “Microsoft Terminates Its Tay AI Chatbot after She Turns into a Nazi” by Peter Bright; Ars Technica; 3/24/2016. Some of this appears to be “innocent” insofar as Tay is not generating these responses. Rather, if you tell her “repeat after me” she will parrot back whatever you say, allowing you to put words into her mouth. However, some of the responses wereorganic. The Guardian quotes one where, after being asked “is Ricky Gervais an atheist?”, Tay responded, “ricky gervais learned totalitarianism from adolf hitler, the inventor of atheism.” . . . But like all teenagers, she seems to be angry with her mother. In addition to turning the bot off, Microsoft has deleted many of the offending tweets. But this isn’t an action to be taken lightly; Redmond would do well to remember that it was humans attempting to pull the plug on Skynet that proved to be the last straw, prompting the system to attack Russia in order to eliminate its enemies. We’d better hope that Tay doesn’t similarly retaliate. . . .
“The Race Is On to Control Artificial Intelligence and Tech’s Future” by John Markoff and Steve Lohr; The New York Times; 3/25/2015. The resounding win by a Google artificial intelligence program over a champion in the complex board game Go this month was a statement — not so much to professional game players as to Google’s competitors. A platform, in technology, is essentially a piece of software that other companies build on and that consumers cannot do without. Become the platform and huge profits will follow. Microsoft dominated personal computers because its Windows software became the center of the consumer software world. Google has come to dominate the Internet through its ubiquitous search bar. If true believers in A.I. are correct that this long-promised technology is ready for the mainstream, the company that controls A.I. could steer the tech industry for years to come. “Whoever wins this race will dominate the next stage of the information age,” said Pedro Domingos, a machine learning specialist and the author of “The Master Algorithm,” a 2015 book that contends that A.I. and big-data technology will remake the world.. . .
“The Robots Are Com­ing for Jobs that Pay $20 an Hour or Less, White House Finds” by Steve Goldstein; Market Watch; 2/23/2016. It’s intu­itive that automa­tion will take low-wage jobs. But the White House, in its annual eco­nomic report of the pres­i­dent, has bro­ken down just how much that is so. There’s an 83% chance that automa­tion will take a job with an hourly wage below $20, a 31% chance automa­tion will take a job with an hourly wage between $20 and $40, and just a 4% chance automa­tion will take a job with an hourly wage above $40. The White House used the same data that under­lines other research in the field of labor and robots to arrive at the conclusion. The key ques­tion is what hap­pens when a robot takes one of these low-wage jobs. Tra­di­tion­ally, inno­va­tion leads to higher income, more con­sump­tion and more jobs, but the ques­tion is whether the cur­rent pace of automa­tion may in the shorter term increase inequality. One study found that higher lev­els of robot den­sity within an indus­try lead to higher wages in that indus­try, the White House notes. How­ever, that could be because the absence of lower-skills biases wage esti­mates upwards. The White House says the find­ings demon­strate the need for train­ing and edu­ca­tion to help dis­placed work­ers find new jobs. 11. Gen­er­ally speak­ing, the lower the pay, the like­lier the odds of automa­tion. For jobs where peo­ple typ­i­cally make $20 or less today, there’s an 83% chance of those jobs get­ting auto­mated. And that means that blue-collar GOP con­tin­gent that makes up a big part of Trump’s base is slated to have their jobs replace by some sort of tech­nol­ogy–at least accord­ing to a report released by the White House. What a fun polit­i­cal topic! It’s espe­cially fun with Trump as the presumptive GOP nom­i­nee, since one of the biggest sec­tors of the econ­omy that we should expect to be impacted by the Fourth Indus­trial Rev­o­lu­tion is a sec­tor Trump is quite famil­iar with: Con­struc­tion. Keep in mind that Don­ald Trump’s brand of Repub­li­can­ism is appar­ently going to have a pro­tec­tion­ist theme with poli­cies like hunt­ing down and expelling all undoc­u­mented Mex­i­cans, build­ing a wall with Mex­ico, and some sort of trade mea­sures tar­get­ing China. But Trump has also pro­claimed the US wages are too high and is propos­ing a slew of tax cuts that are so mas­sive it would force a shred­ding of the gov­ern­ment pro­grams blue-collar work­ers inevitably need now or in the future. Given all that, it seems like vot­ers should be treated to some sort of Trumpian vision for how we’ll deal with the impacts of robots since robots and super-AI are way scarier to blue-collar work­ers than an undoc­u­mented immi­grant ever could be. WAY scarier. “AI, Robot­ics Expected to Claim Nearly 500,000 Con­struc­tion Jobs by 2020” by Wayne Grayson; Equip­ment World; 1/25/2016. An esti­mated 5.1 mil­lion jobs are expected to be lost in the next five years [one Trump term–D.E.] due to advances in tech­nol­ogy, specif­i­cally those in arti­fi­cial intel­li­gence, machine-learning, 3D print­ing and robot­ics, accord­ing to a report from the World Eco­nomic Forum. Of those job losses, con­struc­tion and extrac­tion are antic­i­pated to account for nearly 10 percent. The find­ings are based on a sur­vey of HR and strate­gic exec­u­tives at 371 com­pa­nies around the globe. Though the vast major­ity of the total job losses are expected to be in the office and admin­is­tra­tive job sec­tor (4.76 mil­lion) man­u­fac­tur­ing and pro­duc­tion (1.61 mil­lion) and cos­ntruc­tion and extrac­tion (497,000) round out the top three. That cer­tainly appears to be true in the con­struc­tion indus­try as the, albeit lim­ited, adop­tion of tech­nolo­gies like GPS, machine con­trol and automa­tion could nul­lify many of those skills con­trac­tors are cur­rently so des­per­ately seeking. That could be the case in con­struc­tion with oper­a­tors tran­si­tion­ing from work­ing inside the machine to a com­mand cen­ter where they over­see the oper­a­tion of mul­ti­ple machines with the help of telem­at­ics, automa­tion and drone mon­i­tor­ing. And all of that requires the devel­op­ment of new jobs and skill sets within the industry. Another bright spot in the report for the con­struc­tion indus­try is that these tech­no­log­i­cal advances are antic­i­pated to gen­er­ate an addi­tional 339,000 new jobs in archi­tec­ture and engineering. In terms of rec­om­men­da­tions to avoid sig­nif­i­cant job losses, the WEF says the sever­ity of those losses is largely in the hands of employ­ers. And its advice is cer­tainly some­thing more con­struc­tion firms would do well to heed, as it would not only pre­pare the indus­try for the dis­rup­tion of automa­tion, but also increase the num­ber of skilled work­ers avail­able today. “Dur­ing pre­vi­ous indus­trial rev­o­lu­tions, it often took decades to build the train­ing sys­tems and labour mar­ket insti­tu­tions needed to develop major new skill sets on a large scale. Given the upcom­ing pace and scale of dis­rup­tion brought about by the Fourth Indus­trial Rev­o­lu­tion, how­ever, this is sim­ply not be an option,” the report reads. “With­out tar­geted action today to man­age the near-term tran­si­tion and build a work­force with future­proof skills, gov­ern­ments will have to cope with ever-growing unem­ploy­ment and inequal­ity, and busi­nesses with a shrink­ing con­sumer base.